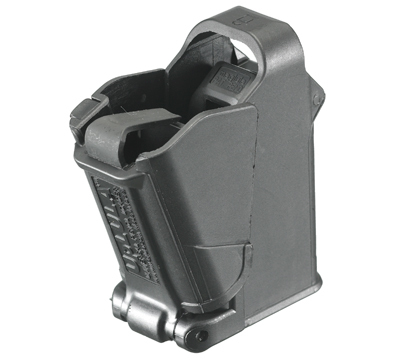 The UpLULA™ magazine speed loader is a military-grade, universal pistol magazine loader designed for loading and unloading virtually all pistol calibers from 9mm up to .45 ACP. Works with single and double stack magazines from all manufacturers easily and painlessly! The rounds drop in with no finger pushing or pressing. One size fits all, no inserts, spacers or adjustments. Made by Maglula Ltd.
It’s so easy my 6 year old grandson can load every mag from 9mm to 45 acp. He can even load my Glock 33 rd mag. Well worth the money! works great, thanks very much! great to have if you do alot of shooting. Few things work as well as advertised, this is the exception. Makes loading new mags a pleasure and painless. Awesome for my small hands female and arthritic joints. Will never be without it. Makes throwing 200-300 rounds downrange... a cinch! Ordered loader 5 days ago. It came ups,I loaded 8mags,in just about 8min. I thought it was a little expensive, but after work with it its worth every penny. Makes loading the SR9c magazines a cinch. Couldnt believe how much a difference this makes! While Ruger includes a small loader with the pistol, the Uplula is a much better solution. I went on Amazon and bought the small base insert to use for loading small cal 380 ammo clips. They do not include this base adapter with the basic Uplula. Once it is added, you are covered for everything. This works great! Worth the price. Like the previous reviewer I have arthritis in my hands and fully loading almost any magazine was an impossibility for me. But with this loader I can get the last round in without any trouble at all. I only own two pistols, a Glock 40 and a Ruger LC9s and it works beautifully on both. Several years ago, I bought a different brand of loader. It did the job, but wasnt worth the work involved. After seeing this loader uplula work differently, I bought it hoping it would do the trick for someone with arthritis. Since I have a few centerfire calibers, and it works fantastic in all of them, this loader gets and easy five stars!! I shouldve bought it sooner. Fantastic- I was afraid I was too weak to load more than 3 cartridges - severely limiting my new pistol. Saved!!! I can now load up to 16 easily!! Get one, worth every penny! !